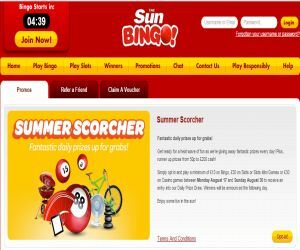 Sun Bingo's Summer Scorchers| Grab daily prizes + £30 FREE! Sun Bingo is well and truly bringing on the heatwave this August with its fiery Summer Scorchers. Even if the English summer's not quite going to plan on the tanning front – you can always count on Sun Bingo to fire up the entertainment stakes and lead you to scorching riches! With Sun Bingo, you can expect an awesome hot spell of fun, as the reels will be saturated with bank-busting prizes each day! To get in on the sizzling action, you just have to wager a minimum of 10 on Bingo games, £30 on hot slots, instant slot mini games or pulse-racing casino games. You’ll then unlock your ticket to the Daily Prize Draw, to grab a hot slice of the prize pie! Each day, you could be one of the lucky 5 to win a wall-to-wall collection of action-packed prizes. These smile-inducing rewards range from a family Go Ape day, Red Letter Day Family Treehouse Experience or Harry Potter World adventure, to a Champney’s Spa break, an iPad Mini, pr 4 mountain bikes! With this feverish promotion, even runners up can fill their pockets with cash, ranging from as low as 5p to as high as £200! Luckily for you, 5 Winners also have the chance to be selected to enter the Lucky Dip Draw to snap up more prizes Monday August 31! There are plenty of other chances to rack up scorching rewards this summer at Sun Bingo, with hours of Free Bingo being hosted at selected times each and every Tuesday and Thursday! Sun Bingo has also launched its brand new awesome Daily Free Doubly Bubbly game. This fun-packed adventure offers the chance to win up to £750 cash, or up to 50 Free Spins to use on all your favourite games! When you first cruise into the world of Sun Bingo , you can kick start your adrenaline-filled experience with a scorching Welcome Bonus. You simply need to spend a tenner, and you can collect a fab £30 FREE, so you can start playing with £40! Don't forget to check the site for more scorching offers! Happy playing!